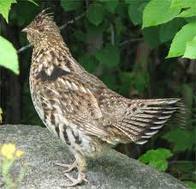 offered at our Hunting Lodge in the Rainy River District of Northwestern Ontario Canada. 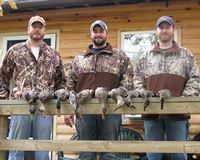 We offer full service Ontario Hunting Trips as knowledgeable Ontario Hunting Outfitters and hunting guides. Please CLICK the ABOVE LINKS to view your hunting category of interest on our web site for all details and information on the hunt. Hunting, whether for Deer, Bear or Ducks, has been the main service that has always been provided at Harris Hill Resort since it was established. The main reasons would be the large number and variety of wildlife in the area, low pressure hunting in this area, and the low population of inhabitants. There are miles and miles of remote land and wilderness areas that we can access for Deer hunting. 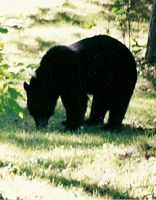 We have assigned areas for our Black Bear Hunts that cannot be hunted by anyone else either. Our Bear Management Area is one of the largest in NorthWestern Ontario. 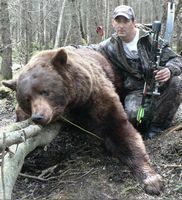 Once again Ontario offers a Spring Bear Hunt as well as a Fall Bear Hunt. We have an incredible opportunity for Waterfowl hunts here. Our Bay in front of the lodge has rice beds and reeds that provides shelter for the hunters and encourages an influx of Ducks and Geese. This is also a known migratory flight route for a variety of species of Ducks and Geese. 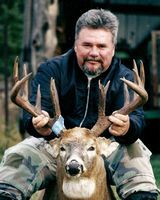 Whitetail Deer Hunts are VERY POPULAR here now because of our managed and baited sites. 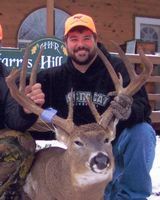 Whitetail Deer Hunts are very popular for both residents and non-resident Deer Hunters. It is amazing to see the number and quality of Trophy Bucks that come out of this area every year. A Timber Wolf may be harvested while you are on a Whitetail Deer Hunt - inquire at Harris Hill Resort. Minimum Age for hunting is 16. *You MUST have a current or old Rifle hunting license, from your State or Province (or previous hunt license from Ontario), with you to obtain an Ontario Hunting License, or else you need a bona fide "Hunter's Safety Certificate". Plugs are mandatory for shotguns for Big Game. Steel shot is required for waterfowl ( ducks, geese on water ). Not required for Geese on land. All firearms, including bows, must be cased while being transported from camp to hunting areas ½ hour before sunrise and ½ hour after sunset. This could be a "soft sided" case or a "stocking" case or a "hard" case. Blaze orange vest or jacket or coat and cap or hat are required for Big Game Hunts for Black Bear, Rifle Season Whitetail Deer, Wolf Hunts during other "big Game" hunting season, and also for Grouse hunting. They cannot have camouflage on them. Dogs: vaccinations and papers are required for border crossing. Portable Kennels are required. Dogs may not be left in camp unattended. All firearms must be registered at the Canadian Border when coming to Canada.There is a $25 charge to register your firearms. Archery Equipment does not have to be registered to come across the Border, however they have to be mentioned. E) A Certificate issued to him/her after Jan 1 1968 by a competent authority in any jurisdiction which indicates that the holder was or is authorized to purchase a hunting licence in that jurisdiction, that permits the use of a gun. HUNTING SEASONS & REGULATIONS: Please view these government links for details. Harris Hill Resort is in Wildlife Management Unit 10 - WMU #10, and close to WMU 7B. Please read each specific hunting section pertaining to your hunt on our website for more detailed info. Please check the “visitor” section on our web site for useful info on coming to Canada, such as calling Immigration to make sure you are able to come into Canada (no criminal records or Drinking & Driving Offences). You are not allowed to bring potatoes, live minnows, leeches, worms/night crawlers in soil, or pet food through the USA into Canada. You are not allowed to bring citrus fruit like oranges into the USA from Canada. AN “OLD”HUNTING LICENSE (from Ontario or from your state) to turn in or aCLEAR photocopy of this year’s hunting license. You must bring this info with you when you come also for verification in order to receive a hunting license here. I will mail you the firearm form that you can fill out prior to your arrival to expedite border crossing formalities. Cost is $25 CAD at the Canadian Border to register your firearms. This does not have to be filled out for Archery Equipment, however you do have to mention this archery hunting equipment when crossing the border. The Non-Resident Firearms Declaration http://www.rcmp-grc.gc.ca/cfp-pcaf/form-formulaire/pdfs/5589-eng.pdf must be presented in triplicate, unsigned, to a customs officer at your first point of entry into Canada. Firearms must be registered for a fee of $25.00 CDN (for all firearms). The printable non-resident firearm declaration form is available at http://www.rcmp-grc.gc.ca/cfp-pcaf/form-formulaire/pdfs/5589-eng.pdf. Here you can view it and print it off, and have it completed fbefore you get to the border. BLAZE ORANGE cap, hat or toque (stocking cap) for Bear & Deer hunting seasons. Cannot have cammo on it. BLAZE ORANGE vest, jacket or coat for Bear or Deer hunting season. No Cammo on it. Blaze Orange is mandatory for walking in & out of stands. The vest must be completely blaze orange and cover 400 square inches above the waist and be visible from all sides. Open Mesh must not be part of the 400 Sq Inches. There cannot be camouflage on either cap or vest/jacket/coat. The cap may have a logo on it. Warm comfortableboots and clothing, including “long underwear”. Lined rubber boots or waterproof boots may be needed in certain years. A compass or GPS sometimes comes in handy. Buck Scent or Doe Scent may sometimes be used but ask us first before going out to the hunt. “Walkie Talkies” may sometimes be used but ask us first before going out to the hunt. Gun cases, soft or hard case, to put your firearm in when leaving your stand past sunset.